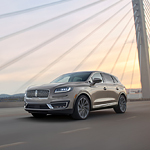 Starting at just more than $40,000, the 2019 Lincoln Nautilus flaunts luxurious features. This compact crossover SUV comes standard with five seats. You can visit Korum Automotive Group to check out the base, Select, Reserve and Black Label editions. The ergonomic front seats in this lavish family car are wrapped in the patented Bridge of Weir Deepsoft material, which is primarily made of real leather. Having a 22-way design, the optional Ultra-Comfort front seats are virtually unrivaled in ergonomics. These high-end seats include climate control, massaging air cushions and thigh supports. Adjustable head restraints and lumbar supports also provide extra comfort. The second-row seats in the 2019 Nautilus include the EasyFold technology for quick adjustments. Heating is also integrated into these 60/40 split-folding seats that accommodate three passengers. When it comes to utility, some of the car's amenities include the 110-volt AC power outlet and dual smart-charging USB ports.